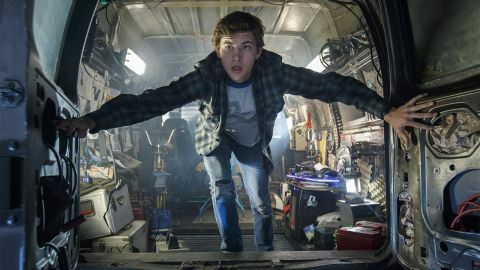 Ready Player One review: "Spielberg gets his game face on with spectacular results"
Spielberg gets his game face on with spectacular results. One extended scene - no spoilers! - is as fun as cinema gets. Back when Steven Spielberg started making serious-minded historical dramas such as Schindler’s List, Amistad, and Saving Private Ryan, he stroked his greying beard and declared that he wasn’t sure he could ever again make a movie that was pure popcorn. And sure enough, many of the films that followed (Munich, Lincoln, War Horse, Bridge of Spies, The Post) bore this out; hell, even his trio of FX-heavy science-fiction numbers, A.I: Artificial Intelligence, Minority Report, and War of the Worlds, were, respectively, chillingly cerebral, desaturated and dystopian, and charged with the horror of real-world terrorism. As Kingdom of the Crystal Skull, The Adventures of Tintin: The Secret of the Unicorn and The BFG have demonstrated, though, Spielberg’s inner child, for better or worse, was never going to pipe down altogether. Well, the pop-culture smorgasbord that is Ready Player One now allows that oft-muffled moppet to scream joyously at the top of his lungs and boy, it’s most certainly a good thing. It’s hard to imagine another filmmaker who could so build astonishing new worlds, marshal stupendous set-pieces and maintain a beating heart while pitching Iron Giant against Mechagodzilla. Based on Ernest Cline’s best-selling, award-winning 2011 novel, Spielberg’s 32nd feature is set in Columbus, Ohio, in 2045. Drought and riots have “made reality a bummer”, as the voiceover of our teen hero Wade Watts (Tye Sheridan) tells us, and the teeming population rammed into this rat-maze city live in tottering towers of scaffolded trailers, like kitchen-sink Jenga. Escape comes in the form of the OASIS, a virtual-reality world created by James Halliday (Mark Rylance), a pop-culture junkie who’s part Steve Jobs, part Willy Wonka. Here, the “only limit to reality is your imagination”, meaning your avatar of choice can visit a casino the size of a planet, ski down the Pyramids or scale Mount Everest with Batman… all while real-world you scoffs hamburger in your trailer. In the OASIS, Wade’s avatar is Parzival, while his best friend, who he’s never actually met, is the hulking Aech (Lena Waithe). Two becomes three when Parzival develops a crush on cool-girl Art3mis, who, as Aech points out, might really be a 300lb dude slumped in his mom’s basement (though we know from the credit list it’s Olivia Cooke). Rather like Christopher Nolan’s Inception, Ready Player One faces the none-too-easy task of freighting its fantastic action with real-world consequences or else jettison any sense of peril. What good, after all, is a fast and furious multi-player car race with drivers being swatted off buckling roads by a leaping King Kong and a stomping T-Rex (not all the pop-culture nods are ’80s-based) if players just take off their headsets, get a Pizza Hut drone-delivered to their trailer, and go again? It’s a task that Spielberg gamely rises to, with the action zipping back-and-forth between Parzival and Wade as IOI’s determination to find the egg triggers attempts to kill their main rival. For real. Gunters (egg hunters) hooked on the OASIS, meanwhile, throw money they don’t have at their addiction, accruing debts, losing homes. Likewise, in true Spielberg fashion (he really didn’t need to fret about making pure popcorn movies because he never did), the pupil-dilating, brain-frying spectacle is loaded with his pet themes – broken families, lost kids, fear of authority – plus some new observations on our obsession with nostalgia and the emotional costs of the avatar-age we now live in. The only way to win, Wade/Parzival discovers, is to embrace your real-world identity, to learn to trust others and communicate. At two hours and 20 minutes, most of them frantic and kinetically shot with a weightless, video game-style camera, Ready Player One is too much of a good thing. But with an exuberance and wonder that recall Spielberg’s early blockbusters, a soundtrack of ’80s-anthems and one mountainous avatar, i-R0k (TJ Miller), giving Thor: Ragnarok’s Korg a run in the deadpan stakes, this rollicking ride is worth a sore arse and a little motion sickness.